Where's That Sound Coming From? : WTSCF Podcast Episode 15: "The Hunter Gets Captured By The Game"
Where's That Sound Coming From? Dissecting and hopefully finding new angles to explore in old sounds. WTSCF Podcast Episode 15: "The Hunter Gets Captured By The Game"
Q: When is stalking a person not creepy? A: When the the stalker's stalkee is simultaneously stalking his or her stalker. Does that make sense? It's like in that scene in Duran Duran's video for "Hungry Like the Wolf" when Simon LeBon and his jungle-dwelling love interest are both chasing and hiding from each other until they come face to face. Smokey Robinson's "The Hunter Gets Captured By the Game" describes this scenario (without all the heavy breathing featured in the D2 song) perfectly. It's a rare, but happy scenario when you find out that your crush is simultaneously crushing on you. Saves a lot of hassle, but then again, some people love the hunt more than the kill. 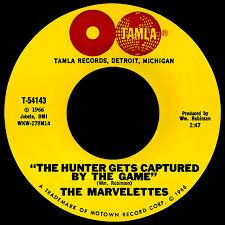 In any case, this little pocket masterpiece, first recorded in late 1966 by The Marvelettes, hasn't been covered by a ton of artists, but it has been covered by a broad spectrum of artists, from Ella Fitzgerald to Massive Attack. And guess what? In this instance, the awards for the longest and noodliest guitar solos (if such awards existed) do not go to Jerry Garcia by any stretch. His solo is short and on point--so take that, stereotypers. It's in fact a couple of new wavers that take home those awards. I'd rather be playing the drums, but then it's hard to let people know what I'm thinking. In addition to geeking out about irrelevant things, I write songs (for my own project) and play drums (for a dozen other peoples' projects).